My human is still sick, so in the meantime, here are some photos from past Christmases — you already saw my first Christmas, so here are the rest! 2015 was the first year I was here that we had a Christmas tree. That year, my human set up some sort of semi-elaborate photo shoot for me. 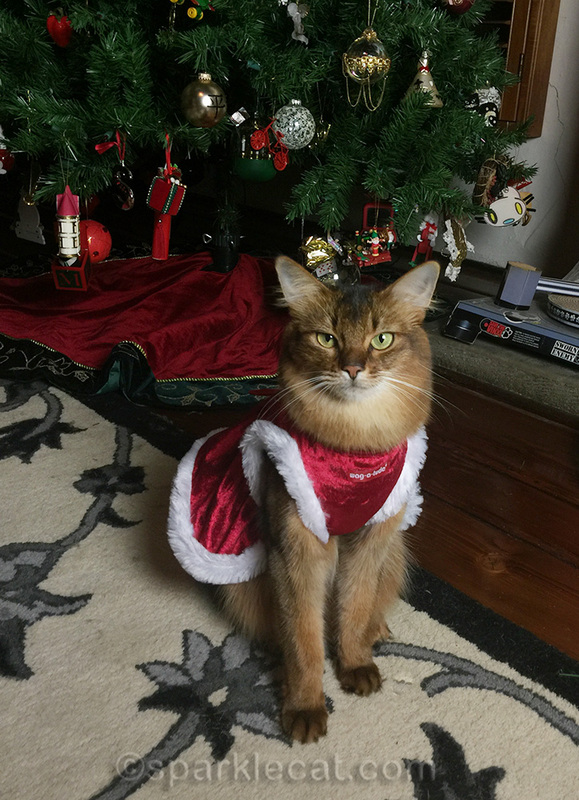 In 2016, my human brought home this ill-fitting Santa outfit for me to model. I posed in a cute Santa dress in front of that year’s tree. 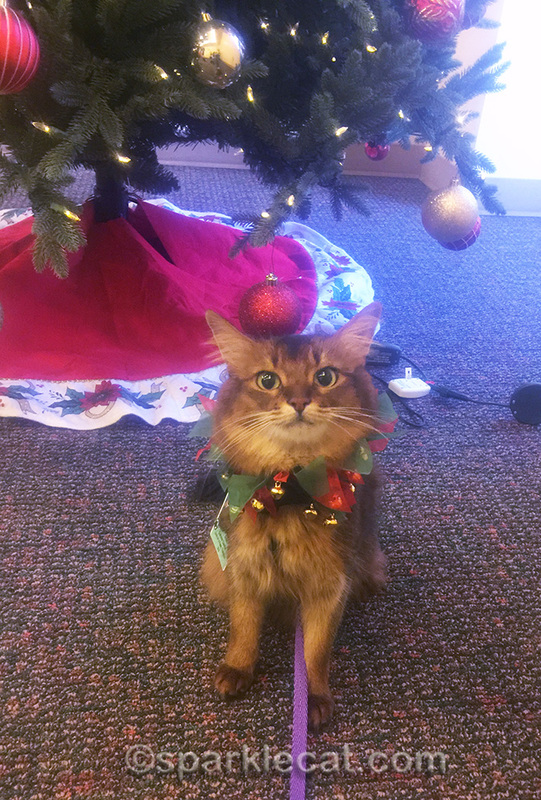 Last year, I posed in front of this tree in the lobby of one of the hospitals where I do therapy cat visits. I wish I could have done more therapy cat visits during this year’s holidays, but with my human unwell, I was only able to do one. 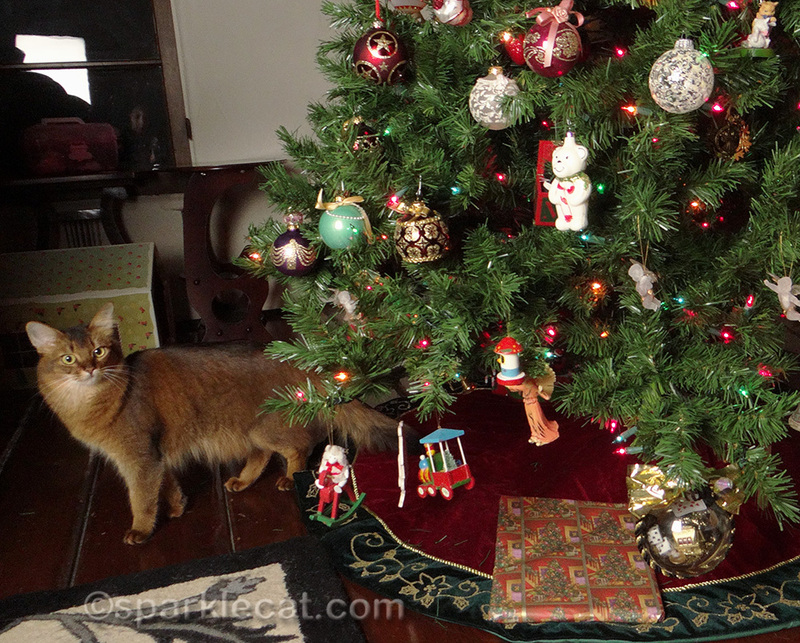 And here are Binga and I, in front of last year’s tree. 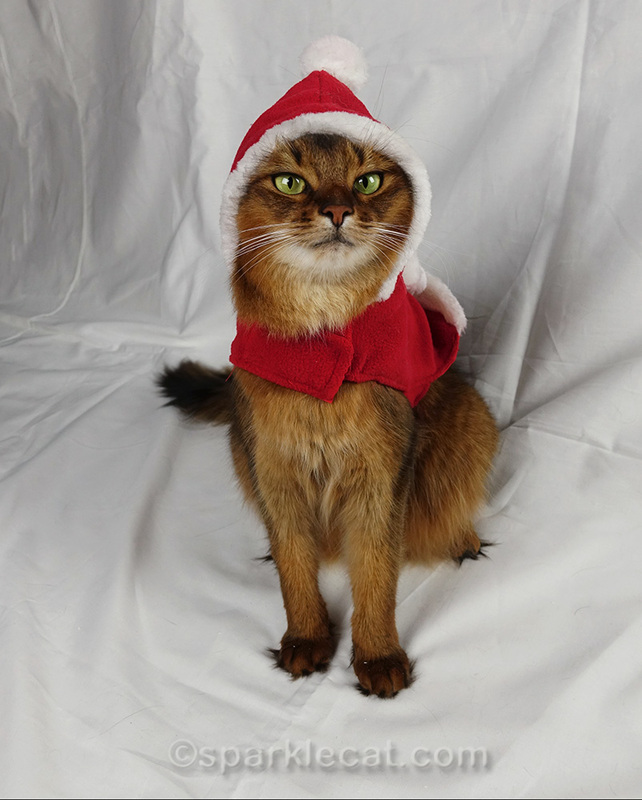 And yes, I am wearing that dumb Santa outfit from 2016 again. At least I didn’t have to wear it this year! I hope you are having a happy, healthy holiday! Happy Holidays, friends! We hope your human is well very soon. You two make my day after Christmas. Happy happy day after dear girls. Great Christmas flashbacks Summer! So sorry your human isn’t feeling well this year – not fun to be feeling bad ANY TIME but holidays most especially. Merry Christmas and Happy Holidays. We’re glad to call you our friends. Summer, you are perfection in any outfit/pose. Purrs to yer Bein, Summer! Merry Christmas! You look adorable in everything you wear! Get well soon Human. Merry Christmas Summer and Binga! Summer I am sending lots of get well purrs for your human. 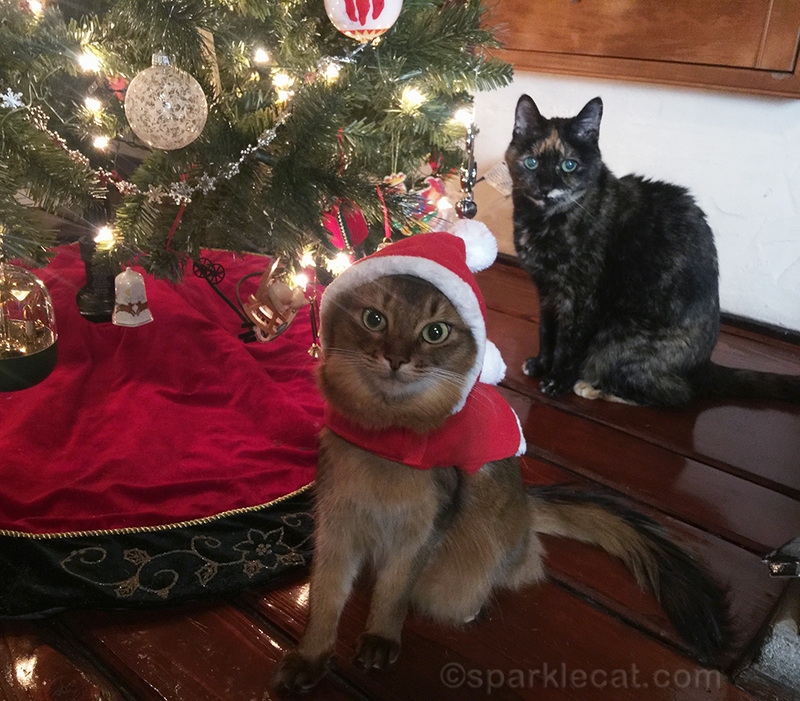 Summer: Merry Christmas to you, Binga and Boodie and especially your human. DiNozzo and I do hope she feels better soon! what great memories!! Merry Christmas!! Hoping you are feeling much better! Merry Christmas to you, Summer, and your family. Purr prayers to your mom. We loved all the sweet Christmas photos! Merry Christmas! Love, Peace, and Blessings to One and All from Deb and the Zee/Zoey gang and we hope your human will be on the mend soon!! 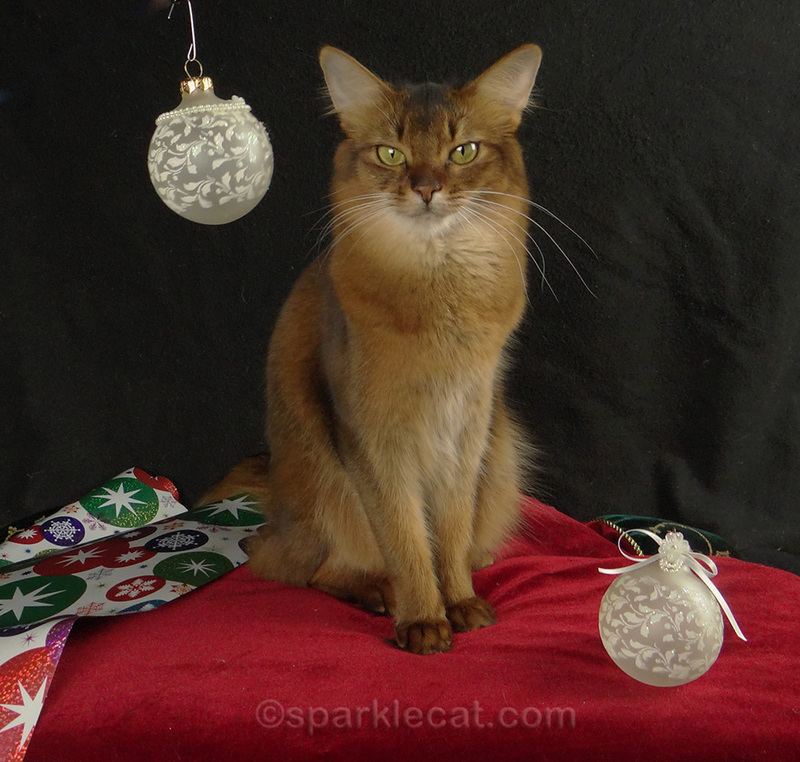 Merry Christmas to you, Binga, Boodie and your human, and lots of healing purrs to your human! Sending healing purrz to your human. She sure got tortured. Merry Catmas anyway. Merry Christmas all! Hope your human starts feeling better; I read on FB that she has an appointment on Wednesday, so my fingers are crossed that she’s much better before then! I’m sorry to hear that your momma is still not feeling well. I hope Christmas brings a full recovery for her. Kisses. Oh dear. My human got flu in October and was sick for ages. A lot more work for me. She is still not back to full health. We both hope that your human recovers quickly. You and Binga will have so much to do supervising and comforting her! Make sure she looks after herself and doesn’t get busy again too soon. Your Santa outfits are cute. do some extra therapy visits. purrs to your human, Summer! we hope she is feeling better soon. wonderful Christmas pictures, Summer. the last picture of you with Binga just looks so natural. Merry Christmas! Christmas is a good look for you! And Binga… yeah, she does what she wants. Hope your human feels better! Merry Christmas Summer,Binga and your human! Merry Christmas to all of you. We sure hope your human feels better really soon. Merry Christmas to you and the other cats, and to your human who I hope feels better for Christmas. We liked seeing the Christmases of prior years! Oh my, these are so pretty, Summer!! I love the picture with Binga in the background, because she looks so nice, lovely, and peaceful in that picture! Merry Christmas, Summer, Binga and Boodie! We sure hope your human starts feeling better very soon. We send love and light and purrs for her well-being and health. Our very best to you all, especially your human–we hope she’s better very soon. Happy Christmas and happy New Year too! Hope your human gets better soon. Maybe Santa will take away that horrible outfit as part of your present this year, Summer. Merry Christmas dear friends, we sure hope your human feels better soon. WE sure hope your human feels better real soon. A very Merry Christmas to everyone and here’s to a fresh start and Happy New Year! All good wishes to you amazing human! Merry Christmas. I hope she feels better really soon.